Amethyst, the birthstone for February, is a very affordable gem that symbolized a variety of virtues, including piety and humility, to the ancients. The gem’s name is derived from the Greek word amethustos, which means “to prevent drunkenness.” No wonder the Greeks loved to drink wine from amethyst cups! Some amethysts are heated to permanently to enhance their color. Your amethyst jewelry will give you many years of wearing pleasure if cared for properly. It is best cleaned professionally by your jeweler. But if home-cleaning is necessary, use lukewarm water with a mild, soapy solution or jewelry cleaners. To maintain your gem’s brilliance, clean with a small bristle brush, especially on the back where dirt collects. In the annals of gem lore, topaz holds the distinction of being the gem with the widest range of curative powers. Among other things, it supposedly cooled tempers, restored sanity, cured asthma, relieved insomnia and even warded off sudden death. Blue topaz is the December birthstone. Today, many pale to colorless topazes are safely irradiated and then heated to produce a permanent blue color, often strikingly similar to aquamarine. Your blue topaz jewelry will give you many years of wearing pleasure if cared for properly. It is best if cleaned professionally by your jeweler. But if home-cleaning is necessary, use jewelry cleaners or lukewarm water with a mild, soapy solution. To maintain your gem’s brilliance clean with a small bristle brush, especially on the back where the dust collects. Do not clean with a home ultrasonic machine. Blue topaz can chip or break if subject to sharp blows. Avoid exposure to sudden temperature changes. Citrine is a very abundant and affordable quartz gem. Often mistaken for yellow and golden topaz, it has now become an alternative November birthstone to the gem it so strongly resembles. Your citrine jewelry will give you many years of wearing pleasure if cared for properly. Jewelry is best if cleaned professionally by your jeweler. But if home-cleaning is necessary, use lukewarm water with a mild, soapy solution or jewelry cleaner. To maintain your gem’s brilliance, clean with a small bristle brush, especially on the back where dirt collects. Virtually all cultured pearls are permanently bleached to lighten their body color and remove discolorations. In addition, some pearls are dyed to give them a lasting rosy glow. Others are safely irradiated or dyed to give them permanent dark-blue to black colors. Your cultured pearl jewelry will give you many years of wearing pleasure if cared for properly. It is best cleaned professionally by your jeweler. But wiping with a soft cloth after each wearing is also recommended. Do not clean with jewelry cleaners or a home ultrasonic machine. Avoid contact with cosmetics and household chemicals. Diamond, the birthstone for April, is the hardest and most brilliant of gems. It is the chief symbol of marital happiness and, as such, the most popular engagement and anniversary stone. Ancients believed diamonds were splinters of shattered stars. Some diamonds may be laser drilled to improve dark inclusions. Some diamonds may be treated with a glass-like substance to mask fractures. The presence of laser drilling or fracture filling should always be disclosed to the consumer. Although it is generally considered legal and ethical to sell clarity-enhanced diamonds as long as the consumer is informed of the treatments. Your diamond jewelry will give you many years of wearing pleasure if cared for properly. It is best cleaned professionally by your jeweler. But if home-cleaning is necessary, use jewelry cleaners or lukewarm water with a mild soapy solution. To maintain your gem’s brilliance, clean with a small bristle brush, especially on the back where the dirt collects. While diamond is the most scratch-resistant of all gems, it should be protected from sharp blows that can cause chipping. Emerald, the birthstone for May, is one of the most sought after and valuable of all gems. According to legend, wearing emeralds cured a range of problems, including low IQ and infertility. Emerald symbolizes faithfulness and undying love. A fine quality natural emerald is a true rarity and is in great demand in the international marketplace. Due to the nature of emerald crystal growth in the environment, virtually all crystals show a network of fine fissures, and often these fissures reach the surface of the polished gemstone. This does not indicate a defect, or cracked emerald, it is merely an inherent feature of natural emeralds a degree of uniqueness and individuality. All emeralds are treated in some manner to improve the appearance of the stone. 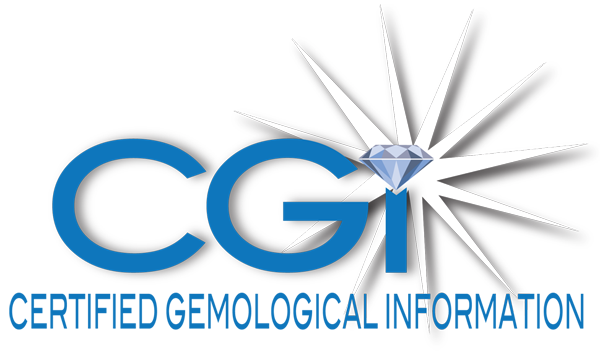 These treatments are usually applied before the gem is cut or faceted. Most emeralds are impregnated with colorless oils to mask fissures and brighten their color. This treatment is not permanent, and can leak from the stone, especially if it is placed in hot liquid, such as an ultrasonic cleaner. Many are filled with an artificial resin that also improves the appearance of the gemstone. The advantage of this particular treatment is that it is permanent, and will enhance the beauty of the emerald for a lifetime. Your emerald jewelry is best if cleaned professionally by your jeweler. However, if home cleaning is necessary, wipe with a soft cloth. Do not use jewelry cleaners or a home ultrasonic machine. To maintain your gem’s brilliance, clean with a soft bristle brush, especially on the back where the dirt collects. Emeralds are fragile gemstones, so protect your emerald from sharp blows and avoid exposure to extreme temperature changes. Usually thought of as a ruby look-alike, garnet is actually a large family of gems that occur in every shade but blue. The varieties which consumers are presently most familiar are pyrope (red), almandine (brownish-red) and rhodolite (pinkish-violet). Garnet is the birthstone for January. Your garnet jewelry will give you many years of wearing pleasure if cared for properly. It is best cleaned professionally by your jeweler. But if home-cleaning is necessary, use jewelry cleaners or lukewarm water with a mild, soapy solution. To maintain your gem’s brilliance, clean with a small bristle brush, especially on the back where the dirt collects. Protect from sharp blows and avoid extreme temperature changes. Iolite gets it’s name from the Greek work ios, meaning “violet”. Iolite is sometimes called “water sapphire” because of its beautiful watery blue color. Believe it or not, Iolite will do exactly what a camera’s Polaroid filter will do: cancel out haze, mist and clouds to make things appear clearer. By observing the sky through iolite lenses, Viking navigators were able to locate exact position of the sun on overcast days. Where did these famous seafarers get iolite? Well, it’s been found in some Viking domains, including Greenland and Norway. Most Iolite is not treated to enhance its appearance. Iolite is a durable gem, but scratches easily. It should be protected from sharp blows and scratches. Your iolite jewelry is best cleaned professionally by your jeweler. If you clean your iolite jewelry at home, use jewelry cleaner or lukewarm water and a soft toothbrush to remove dirt. Up until 1817, when Sir Walter Scott published his popular Ann of Geierstein, opal was a coveted gem, identified with hope. In Scott’s book, however, it symbolized misfortune, an association which hurt its popularity. Later, when opal devotee Queen Victoria took to giving this gem as a wedding gift to her daughters, it made an impressive comeback. Opal is the October birthstone. Some white opal is dyed to give it the appearance of black opal. This treatment should prove long-lasting if stones are cared for properly. Your opal jewelry is best cleaned professionally by your jeweler. But if home-cleaning is necessary, just wipe with a soft cloth. Do not use jewelry cleaners or a home ultrasonic machine. Avoid contact with cosmetics and other household chemicals. Protect from sharp blows. Believe it or not, the fabled emeralds of Queen Cleopatra may really have been peridots mined on a Red Sea island right off the coast of Egypt. Indeed, many emerald aficionados of antiquity may also have been peridot lovers with out knowing it. Peridot is the August birthstone. Your peridot jewelry will give you many years of wearing pleasure if cared for properly. It is best cleaned professionally by your jeweler. But if home-cleaning is necessary, use lukewarm water with a mild, soapy solution. To maintain your gem’s brilliance, clean with a small bristle brush, especially on the where dirt collects. Do not clean with a home ultrasonic machine. Protect from sharp blows because peridots chip fairly easily. Avoid exposure to sudden temperature changes. Ruby, known as the “King of Gemstones,” is a symbol of passion and devotion. Rubies are one of the hardest and most durable of all gems. Rightly so, ruby enjoys thousands of years of preeminence among gems. Even today, the finest specimens of this gem fetch the highest prices of any precious gemstone. Ruby is the July birthstone. Virtually all rubies are treated to improve their appearance. These enhancements are usually applied before the stone is cut and faceted. Controlled heating can improve color and remove some impurities. Some rubies have fissures or surface breaks that are filled with a glass-like by-product of the heating process. This filling may wear over time if treated harshly or exposed to strong solvents or abrasives. Clear resins are sometimes used to fill the surface fractures of rubies. Your ruby jewelry is best cleaned professionally by your jeweler. If home cleaning is necessary, use jewelry cleaners or lukewarm water with a mild soapy solution. To maintain your gem’s brilliance, lean with a soft brush, especially on the back where the dirt collects. Protect your ruby from exposure to chemicals and from sharp blows. Sapphire, one of the hardest and most durable of gems, has been revered for thousands of years. Some ancients believed the Ten Commandments were written on a sapphire tablet. The Persians thought the sky owed its blue color to the light from a sapphire on which the earth rested. Although sapphire is the most popular as a blue gem, it occurs in a wide variety of colors, including pink, gold and yellow. Sapphire is the September birthstone. Virtually all blue, yellow and golden sapphires are heated to permanently produce or intensify color and improve clarity. Occasionally, overly dark blue stones are heated to permanently lighten color. A growing number of pink sapphires are also headed to permanently intensify color. Your sapphire jewelry should give you many years of wearing pleasure if cared for properly. It is best cleaned professionally by your jeweler. But, if home-cleaning is necessary, use jewelry cleaners or lukewarm water with a mild, soapy solution. To maintain your gem’s brilliance, clean with a small bristle brush, especially on the back where the dirt collects. Discovered in Tanzania less than 40 years ago, tanzanite is fast becoming one of the most popular gemstones available today. This modern versatile gemstone may be used as an alternate birthstone for any month on the calendar. Tanzanite is an exotic blue-purple stone that combines the regal purple of a fine amethyst and the alluring blue of a sapphire. Most tanzanites mined today are often heat-treated to remove unwanted colors. This process turns dusty brown stones permanently into the mesmerizing blue-purple stones so sought after today. Your tanzanite jewelry should give you many years of wearing pleasure if cared for properly. It is best cleaned professionally by your jeweler. But if home-cleaning is necessary, use lukewarm water with a mild, soapy solution. To maintain your gem’s brilliance, clean with a small bristle brush, especially on the back were dirt collects. Do not clean with a home ultrasonic machine. Protect your tanzanite from sharp blows to prevent breaking or chipping. In the annals of gem lore, topaz holds the distinction of being the gem with the widest range of curative powers. Among other things, it supposedly cooled temperatures, restored sanity, cured asthma, relieved insomnia and even warred off sudden death. Topaz is the November birthstone. Today, many pale to colorless topazes are safely irradiated and then heated to produce a permanent blue color, often strikingly similar to aquamarine. Often, too, orange-pink stones are heated to eliminate orange and permanently intensify pink. In addition, many pale yellow and light brown topazes are safely irradiated to induce deep golden and reddish-orange colors. These golden and orange stones should be spared exposure to intense light and heat. Your topaz jewelry will give you many years of wearing pleasure if cared for properly. It is best cleaned professionally by your jeweler. But if home-cleaning is necessary, use jewelry cleaners or lukewarm water with a mild, soapy solution. To maintain your gem’s brilliance, clean with a small bristle brush, especially on the back where dirt collects. Do not clean with a home ultrasonic machine. Topaz can chip or break if subject to sharp blows. Avoid exposure to sudden temperature changes. Recognized as a separate gem family for les than 250 years, tourmaline is blessed with the widest array of colors of any species. Because it occurs in so many shades, it was long mistaken for emerald and ruby. Tourmaline is often used as an alternate birthstone for October. 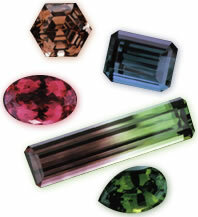 Many tourmalines in the green-blue family are heated to remove unwanted colors, and lighten dark stones. 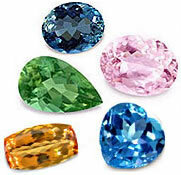 In addition, many tourmalines in the pink-red and blue families are safely irradiated to permanently intensify their color. Your tourmaline jewelry should give you many years of wearing pleasure if cared for properly. It is best cleaned professionally by your jeweler. But if home-cleaning is necessary, use jewelry cleaners or lukewarm water with a mild, soapy solution. To maintain your gem’s brilliance, clean with a small bristle brush, especially on the back where dirt collects. Do not clean with a home ultrasonic machine.